The action is simple to understand why. When the stock market starts to correct, the first action company's usually takes is to reduce costs and keep their stock elevated. The easiest method of lowering a firm's expenses is to reduce their fixed costs (i.e. employees). As a market correction starts to build and prolong, additional employees are laid-off. This action is multiplied by hundreds or thousands of companies all trying to keep the bottom line sincere and stock holders happy. Normally the stock market leads the U.S. Unemployment rate by about six to 12 months. 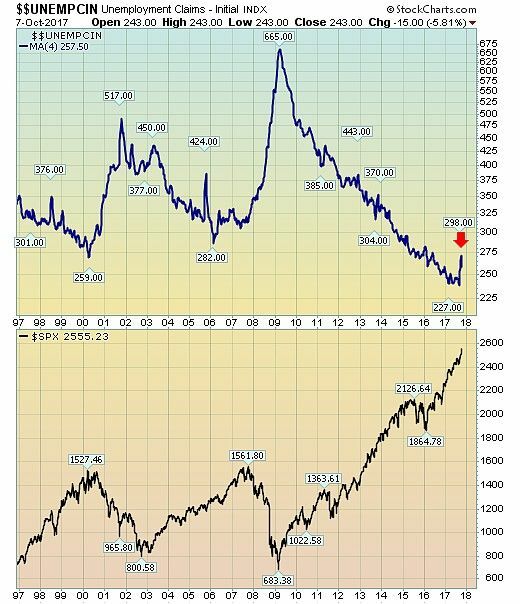 As the present stock market remains buoyant (though overextended short-term), the current spike in the Unemployment rate would suggest that this movement is part of a bottoming process verses a start to a new upward trend. 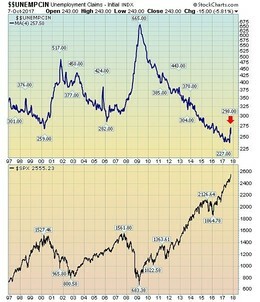 It is not necessarily a signal of a coming rollover in the markets. Brief upward movements can occur, as long as they are short-term. Two examples are in 1998 and late 2005. Both spikes did not signal a sharp market decline. They were, however, within two years of a top. Bottom Line: The recent upward spike in the U.S. Unemployment rate is only a concern if it remains elevated. Should it quickly fall back to 250,000 or less then there should be no alarm. Our models for the markets continue to point toward higher levels over the next few months with a near-term target for the S&P 500 at 2575.